Detecting gravitational waves is an extremely difficult task: the signals expected on Earth are extremely faint (although they have been produced by violent events in the cosmos), and each measurement is affected by many different types of noise. This is a common situation in modern physics, and Virgo is no exception. Therefore, in order to achieve its scientific goal, the Virgo interferometer is based on modern, cutting-edge technologies in many different areas, including optics, mechanics, electronics, and ultra-high vacuum. The substrate is made with the purest glass in the world (it is a synthetic quartz called “fused silica”). This glass has extremely low absorption and is homogeneous and uniform in all the directions. Despite its outstanding properties, it can come in relatively large size. For example, the mirror forming the 3-km arm cavities have a 350 mm diameter, are 200 mm thick, and have a mass of 40 kg. The polishing, to shape the mirror profile, is done at the atomic level: on the central part of the mirror, the largest defects on the surface have a height of just 5 atoms. The last step, the coating, is made to have reflective mirrors. 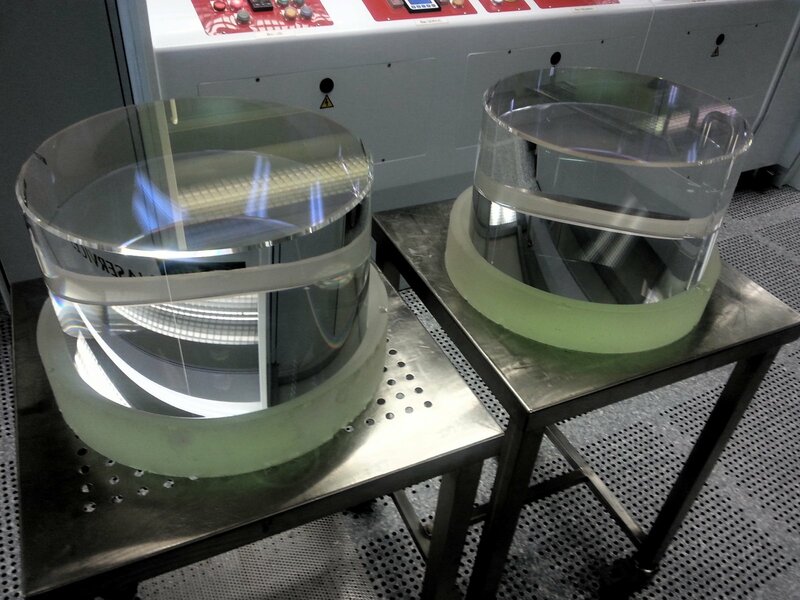 The coating is precisely tuned so that the mirror has the desired reflectivity at the operational wavelength and so that less than 0.0001% of the laser light is lost when it is reflected by the mirror (due to the absorption, residual transmission, or scattering). 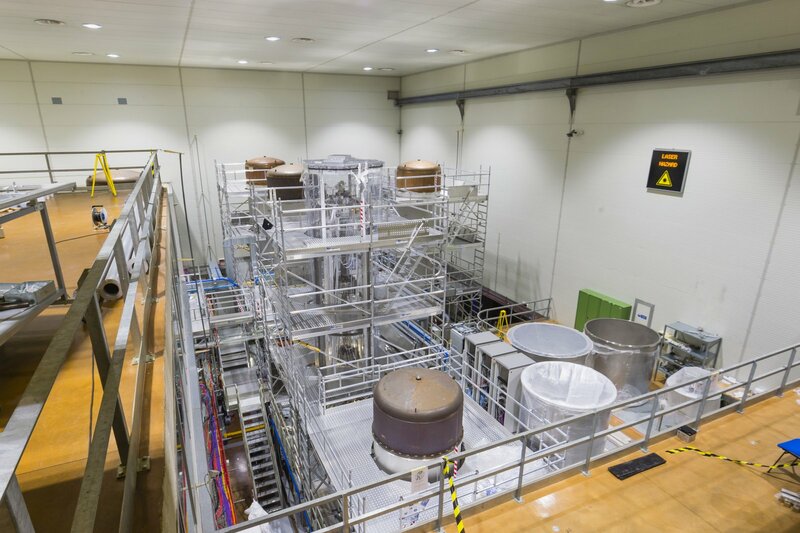 This precise coating is done with a unique machine located in a laboratory of the Virgo Collaboration in the Lyon metropolitan area (Laboratoire des Matériaux Avancés). 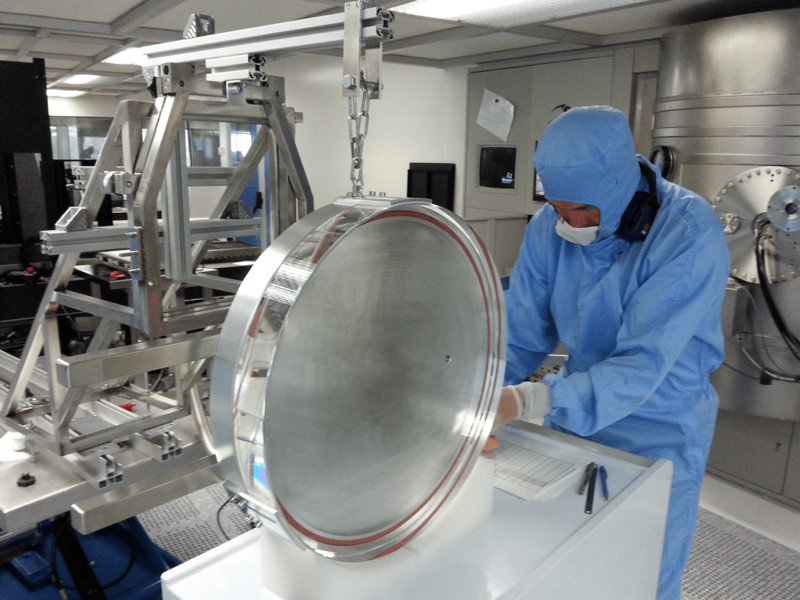 The mirrors for the LIGO interferometers are also coated in this laboratory. 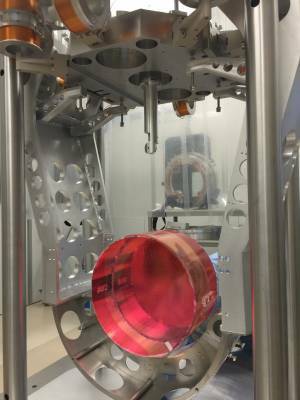 The search for gravitational waves requires extremely precise mirrors, which has in turn pushed forward mirror construction technology. Other physics experiments looking for near perfect mirrors from solar astronomy to quantum measurements can also also benefit from the new development triggered by the Advanced Virgo project. Because of their non-zero temperature, atoms and molecules of mirrors and suspension wires are vibrating: these induce vibrations of the mirror surface that may mimic a gravitational wave passing the interferometer. The way the large mirrors of Advanced Virgo are suspended is thus crucial to reduce this thermal noise. For that purpose, suspensions wires made of the same glass (fused silica) as the mirrors have been developed in order to minimise the pendulum thermal noise of suspended mirrors. These suspensions are called monolithic since the wires are welded to the mirrors and are both composed of the same fused silica. This design allows to reduce the friction at the mirror-wire contact point, which is a source of the thermal noise. With the monolithic choice, the dissipations are so low that pendulum oscillations in vacuum can last for months before stopping. Moreover, fused silica wires have a high breaking strength, about twice that of steel wires. Such strength is very important, since the suspension must be highly resistant to the mechanical stress caused by oscillations of the mirror itself and to possible mechanical shocks of the mirror onto the surrounding materials. The material of the suspension has to be precisely controlled and produced, and carefully manipulated. For this reason the glass fibres (diameter of 0.4 mm and length of 0.7 m) are directly produced in our laboratories in Cascina using a laser machine, and tested with very high accuracy and reproducibility. A particular chemical bonding technique (silicate bonding) has also been developed to join together all the glass components in a unique element. This kind of suspension is apparently very fragile, but instead it is highly resistant along the fibre direction. However, special care must be taken to prevent any possible lateral damage to the fibres themselves. These kinds of suspensions are extremely useful for any low mechanical and thermal dissipation solution. The high quality of the material used and the flexibility of the geometrical structure can be very important in many different applications where high precision measurements are involved. 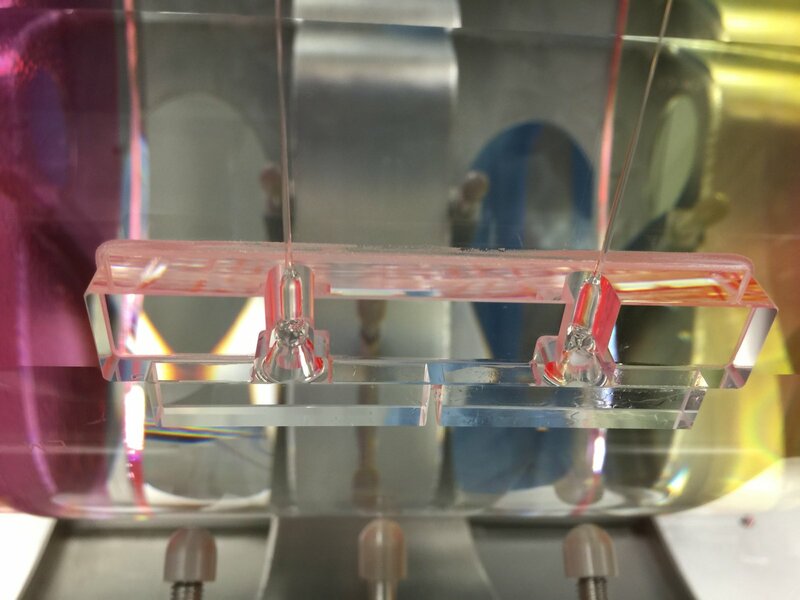 42 kg mirror (with a thin pink protecting film) suspended inside the payload by two thin wires of fused silica (glass). Zoom on an anchor bonded to one side of a mirror and attached monolithically to two thin fused silica wires used to suspend the 42 kg mirror. The Virgo interferometer is a huge optical table placed under ultra-high vacuum. Each optical element is suspended with a seismic isolation system that is housed in a vacuum tank. Two types of suspensions have been developed. The interferometer mirrors and the main optical benches are suspended with the so-called “super-attenuators”, housed in vacuum “towers” about 10-m high. For Advanced Virgo, five more optical benches sensing the interferometer beams have been suspended with the so-called “multi-stage seismic attenuation system” and housed in vacuum “mini-towers” more than 3 meters high. The vacuum towers are linked together by vacuum tubes for the passage of the laser beams. The largest tubes of Virgo, that link the two towers of the Fabry-Perot cavities are 3 km long and 1.2 m diameter. This makes Virgo a huge ultra-high vacuum chamber of 6800 m3. 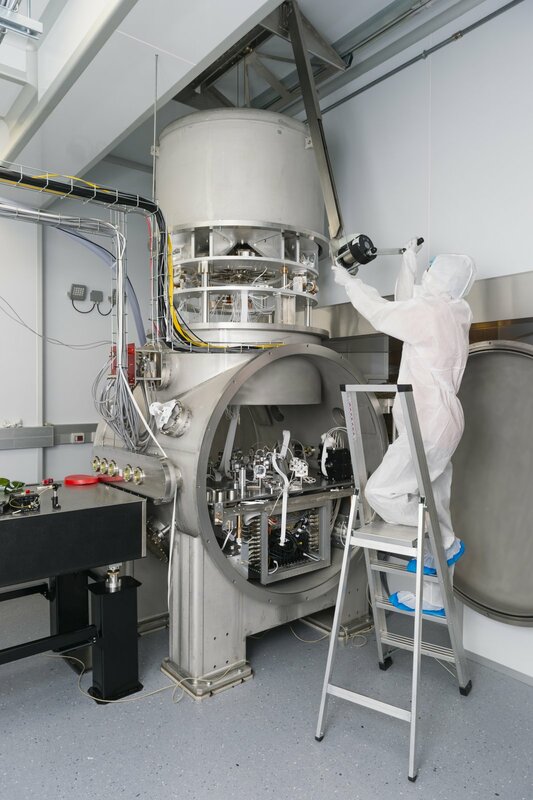 Ultra-high vacuum in the large tubes and around the mirrors is crucial for two reasons. Moving residual air molecules would hit the mirrors, inducing tiny displacements of the mirrors; moreover, the laser beam would interact with the air molecules, modifying its path and loosing power. That would perturb the measurement of gravitational waves. Therefore, the path of the light beam that travels in each Fabry-Perot cavity has to be evacuated down to the extremely low pressure of 10-12 atmospheres (100 times lower than for initial Virgo). To attain this very low value, special metallurgical processes such as hydrogen desorption at 400°C have been developed for the fabrication of the vacuum parts. 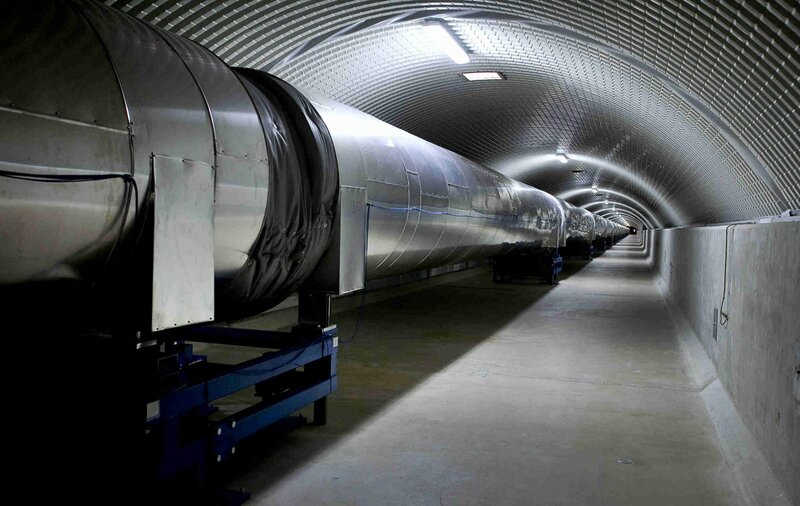 In addition, to eliminate the water vapour in the large 3-km long tubes, they will be heated at 150°C for one month each and cryogenic traps have been installed for Advanced Virgo at each end of the tubes to stop the migration of water molecules from the unbaked towers to the tubes. Despite their thermal isolation, each 3-km vacuum tube requires a power close to 1 MW to perform the heating operation. The optical benches host a lot of mirrors, lenses and sensors (photodiodes and cameras). In Virgo, these optical elements were slightly vibrating because of ground vibrations and environmental sounds. This was limiting the Virgo sensitivity to gravitational waves. In order to attenuate these vibrations, the new Advanced Virgo benches, weighting about 320 kg, have been suspended and placed into vacuum like the large mirrors.